Workers can return to their original employer upon mutual agreement, or transfer to a new employer even without permission or consent of the original employer. Companies can correct the occupations of their workers during the grace period, and free of charge. 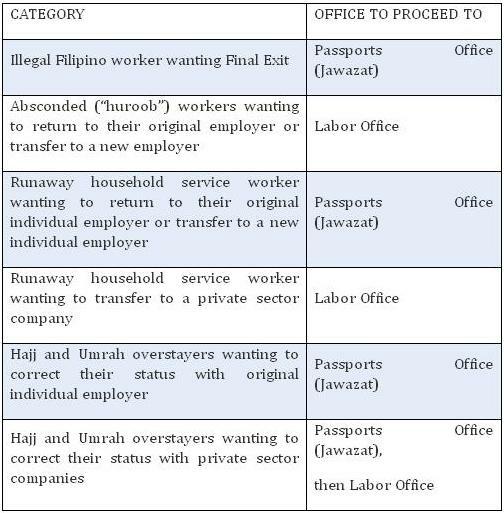 Runaway household workers (“huroob”) can return to their original individual employer or transfer to a new individual employer. The prospective individual employer may complete the procedure for the transfer of the worker through the Jawazat Offices. Household workers can also transfer to a private sector company through the MOL Labor Offices. Illegal Filipino workers have the option to leave the Kingdom (Final Exit) instead, without the need to obtain No Objection Certificates from their current employers, provided that they do not have criminal charges or records against them. They will also be allowed to return to the Kingdom in the future if they are able to obtain valid working visas. Hajj and Umrah overstayers who arrived in the Kingdom before 4 July 2008 can correct their status as either a household service worker or as private sector company worker. Overstaying Hajj and Umrah who arrived after that date may leave without penalties. All penalties and fines accruing to an illegal worker before 6 April 2013 will be waived, except for regular processing charges. Private rights claims between a Filipino worker and his/her current employer will be settled through the court, and will not prevent the Filipino worker to transfer to a new employer. Employers are now clearly obligated to hand over to the worker all his personal documents – such as passports and residency permit (iqama) – upon request. Employers are also obligated to make sure that the residency permit (iqama) of workers are valid. Failure to do so is sufficient grounds for a worker to end their contractual relationship. Specific details of the guidelines are available in both English and Filipino on the Embassy’s website: www.philembassy-riyadh.org The Ministry of Labor also has a customer service number that can be contacted: 920 001 173. The deadline for these concessions is 3 July 2013. After this deadline, the Saudi Government will resume its inspections and arrest and / or apply fines against violators – both employers and employees. The Ministry of Labor has announced that it will be open from 5PM to 9PM in addition to regular working hours. In addition, it has encouraged companies to use the Ministry of Labor’s e-services portal. The Embassy is confirming if the Jawazat Offices will extend their hours, and will inform Filipinos accordingly. There is no need to coordinate with the Philippine Overseas Labor Office for the transfer to a new employer or verify the new employment contract prior to the transfer. The priority is for the new employer to transfer the services through the concerned Saudi authority as soon as possible. Filipinos who need to look for a prospective employer may also wish to check the Ministry of Labor’s www.redyellow.com.sa which has jobs posted with entities that are in the green or excellent zone. They may also call customer service 920011884 of the MOL. Passports that are available are returned for free; there are no charges, and Filipinos should not pay anyone to retrieve them. Those who need to apply for a new passport will be subject to the requirements for a lost passport, with the waiver of the police report. The Embassy will announce mobile passport services and additional hours to accommodate irregular runaway workers who wish to apply for a replacement passport.